*Gene Luen Yang recommends these to special issue editor Joseph Michael Sommers (pp. 372-373) in Sommer's article "Animation, Opportunity, and an "Intro-view" with Gene Luen Yang on Making Actual Movement in Children's and Young Adult Literature" in Toward Greater Inclusion and Representation in Comics and Animation, the winter 2017 special issue (24.4): 365-373 of Children's Literature Association Quarterly, Claudia Nelson, Editor, from The Children's Literature Association. 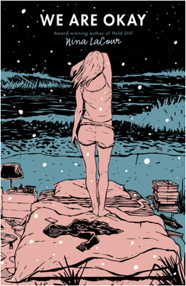 We Are Okay cover reproduced here permission courtesy Nina Lacour.